I was recently reminded of an article I read about how children’s brains are when they are very young - just open receptacles. Whatever you toss in there is getting caught and held. They don’t yet have a developed judgmental/critical mind that will evaluate what they hear before it gets tucked away. They hear, they absorb into themselves. I was recently reminded because I had a friend over for a play date and Ellie was being pretty shy and clingy. I was trying to explain she’s very, very shy. She’s very attached to me, etc. All the things I say to someone who doesn’t know us well so she doesn’t think she or I is a total freak. I don’t know why I worry about what other people think of her so much - but I feel the need to explain I suppose. So can telling her she’s smart, and beautiful, and sweet. (Which she is). This also goes for what we say about the world around her. I heard myself say just last night…”The world is a dangerous place for women. We have to be more careful. It’s why women are more intuitive and better able to judge a person’s character in a short time.” I know this is sometimes the case and I’ve found myself in situations that I had to make a choice about whether to listen to my instincts or ignore them. Usually I listened but no woman on the planet is without a story of how she got that itchy bad feeling and walked away. Or didn’t return a phone call. Or didn’t get into the car. Even still, I don’t want her worldview to be..’the world is a dangerous place for me so I better act accordingly.’ Sure it may be safer if she hides in the house and never takes any risks but…what kind of a life is that? We had been talking about finding babysitter’s on care.com and that some of the photo’s were obviously not appropriate and only a crazy person would trust their kids with them. (The face shot of 20 year old who submits a photo of her coyly holding her fingers to her mouth while dressed in a low cut dress). Really? I’d hire you to nurture and care for my child? Think you’re on the wrong website sweet pea. (Of course the guys were all very interested. I endured some good natured jibes but being pregnant and as big as a whale I did also imagine some well aimed shots to the head.) Pow. Pow. Sometimes I’m cranky when I’m pregnant. La la! Anyway, I was in her room with her yesterday morning playing blocks and I just got hit by this overwhelming sense of gratitude for her, and the real sense that this is the most important job I’ve ever had to do. And I want to do a good job. She makes me want to be a better person. A better mom, a stronger, more independent woman. I just found a t-shirt I love for her - it says Strong girls = Strong world. That’s my job. 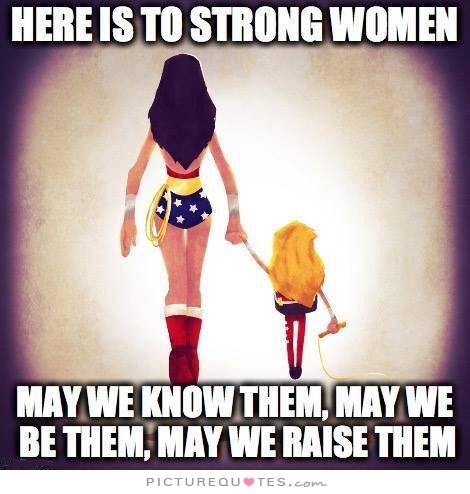 It’s to love, encourage and support her and ensure she sees the strength both in herself and the women she shares the planet with. Lastly, here is a quote and I couldn’t track down the source but I liked it so much I’m adding it here anyway. Let’s go moms! Let’s make the world a better, more supportive place for our little women to grow up in.